G20 Brisbane boondoggle: all talk no action on main stage; yet some hope in voices off. Preaching growth yet not explaining how to achieve it; in denial over pressing global issues and events, yet all too keenly aware of its image, the latest G20 was strong on talk, self-promotion and attention-seeking yet feeble in any useful or real capacity. Lacking any genuine economic theory or strategy, weary world leaders attempted to weather the storm under a threadbare neo-con security blanket, chanting the growth mantra for reassurance while blindly leaving the world’s future to a mythical free market to determine. With dark storms brewing in world finance, peace, climate and health, the G20 fixedly looked the other way, its impotence symbolised by its hapless, outmanoeuvred bantam chairman, Australian Prime Minister, Tony Abbott, who fussed and scratched around his own parochial nest clucking about needing co-payments for doctor’s visits, privatising universities, not taxing carbon and in ‘growing’ GDP, leaving President Obama to set the real agenda. Having promised no talk-fest, Abbott did little but talk, leaving real problems to fester; leaving plans to others; postponed for later. Part of its latest failure arises from the G20’s own flawed nature. It is stretched paper-thin to accommodate a diverse membership. It has no clear identity or Raison d’être, and it meanders in ever decreasing circles, from meeting to meeting, overshadowed by its own ineffectuality – its history of grand intentions undercut by un-met and broken promises. The G20 lacks teeth; it meets to make consensus declarations which are not binding and in Russia’s case in the past, quickly broken. It dances to the tune of the IMF, an institution with a track record of toxic assistance in the form of loans predicated on domestic ‘liberalisation reforms’ – loans which can cripple the beneficiary, as in Argentina’s case in 2001, a country which only began to recover from collapse when it had repudiated its IMF loans and their conditions. The patient can be squeezed to death by the doctor. Accordingly, the G20’s record is one of overpromised, overpriced underachievement. Last weekend’s meeting alone cost Australian taxpayers close to half a billion dollars. The money would have been better spent on the nation’s health and education. Perhaps the trend will continue making the meeting a type of self-bankrupting potlatch ceremony. G20s are long on promises. The naïve would be forgiven for assuming that the G must stand for ‘gunna’ as in Joe Hockey’s line: ‘we are gunna grow GDP by at least 2%.’ Not a murmur from him, however, on how that growth will be achieved. Apart from cutting government spending, which is rather like feeding your pigs less while expecting them to gain weight, there was no road map, no direction given on how to achieve economic growth. This is primarily because reason in economics has been usurped by neo-con dogma. Magical thinking alone, it seems, underpins the Australian leader’s assertions that growth will create jobs, and that the G20 serves ordinary men and women, but who needs evidence when you have dogma? All, it seems, you need is a spin machine and a catchy slogan. All you need is growth; growth is the magical mantra. The record, sadly, tells another story. The feeble growth of the world economy today is a telling reminder of G20’s failure to deliver the goods. Yet it continues to promote IMF doctrine. Rehabilitate the discredited IMF. IMF austerity programmes have yet to make any country better. 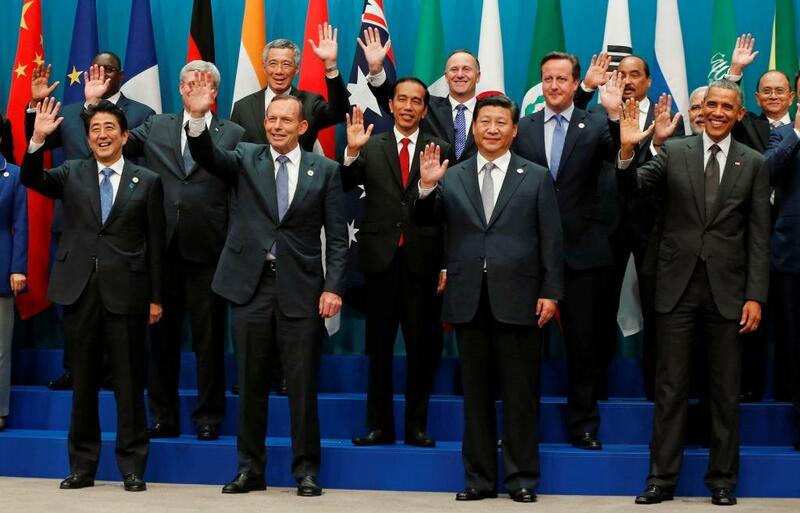 Yet inherent faults aside, or because of them, the latest G20 demanded effective leadership. In a microcosm of the G20’s broader history, that call remained conspicuously unanswered in Brisbane last weekend. Much of the Brisbane G20 meeting’s failure resulted from the narrow horizons, limited understanding and experience of Australian Prime Minister Tony Abbott. Abbott seeks the international spotlight without providing the leadership needed to earn it. Adequate preparation would have been a good first step, as would deeper analysis and understanding of the issues. A broader agenda would have been another; but this would have required better judgement. For Abbott it was a political catastrophe. The PM blew his privileged opportunity to rise to the occasion; to measure up as any kind of international statesman. Spin doctors are now peddling a sanitised version of G20 events which commends world leaders present for setting specific targets. And an agreement to share information which might lead to catching tax-evaders. That’s a lot of spin. The collective GDP growth 2% target over five years is laughably inadequate and there is no agreed plan on how it might be achieved. For practical details each country will have to rely on self-help. Each G20 country’s ministers have been set some homework. They are to bring back an action plan to a November meeting. It’s like an old trick to get everyone else to do your work: lend me your watch and I will tell you the time. The sharing of information about tax fraud is similar. Nations already have all the information required. What is needed is the will. The risk in all this avoidance and aversion is that the world is being helped to repeat the mistakes of the past. Indeed, concealed in the verbiage emerging, especially from domestic failure, Australian Treasurer Joe Hockey is evidence of the bad old laissez-faire thinking that had made the GFC possible. Nowhere is there a glimmer of enlightenment; nowhere is the wisdom of experience, nowhere is there a clear and coherent plan. No road-map. Just a fuzzy, non-binding agreement to pursue growth somehow. But with a lot of figures on it. A lot of lipstick on this pig. Overshadowed by the Ebola crisis, war in the Middle East and Russian ambitions in Ukraine, this G20 was on track towards unparalleled disaster when a ray of hope emerged in the form of Air Force One bearing the United States President Barack Obama. Thank, God for Obama who emerged, deus ex machina, as G20 leader by default. The US President conferred on the G20 an impassioned call to global leadership from ‘off campus’ which its chairman Australian Prime Minister Tony Abbott has neither the wit to understand, nor the means to command. Abbott proved the truth of the old adage that sometimes the job is just too big for the man. Fortunately for the rest of the world, Obama was ready and willing to make up the deficit. Effectively upstaged and sidelined by Barack Obama’s timely ultimatum delivered off site in an impassioned speech at the University of Queensland, Abbott could but listen in as the United States President told him exactly what he thought of him. It was the strongest public statement of contempt yet by a US leader to an Australian PM. Overshadowed if not totally eclipsed, the G20 meeting maundered on its ineffectual way into obscurity assisted greatly by the parochial duplicity of Australia’s Prime Minister Tony Abbott who feigned an interest in boosting world GDP but who proved his only real commitment was to using the meeting as a means to gain global authority to overcome his government’s signal failure to even pass its first budget. Abbott, moreover, has made the risky gamble of pledging to support GDP growth targets by counting on unhatched chickens of budget savings measures he has so far been unable to get through the Australian parliament. Measures that look increasingly unlikely to pass in future. Nothing like honouring your commitments with a cheque that will bounce. Even if the proposed legislation is passed, it is likely to contribute to contraction not growth. Devoid of a plan, lacking any effective theoretical engine yet tracking along IMF rails, the latest G20 show is no less than a collective confidence trick in which world leaders meet to keep up appearances and boost morale while effective control of the world economy is ceded to the caprice of free-market capitalism and vested interests. « G20 Jaws of Disaster for Abbott and his government yet Obama rises magnificently to the occasion.